Samsung’s first foldable device, the Samsung Galaxy Fold, will be released on April 26th. It will be a double-display device with a Main Display size of 1526x2152px and a Cover Display that is 840x1960px. This new form factor requires developers to adapt their apps for two physically-different displays on the same device. Additionally, developers need to provide a seamless transition for app continuity and application behavior with multi-window mode. 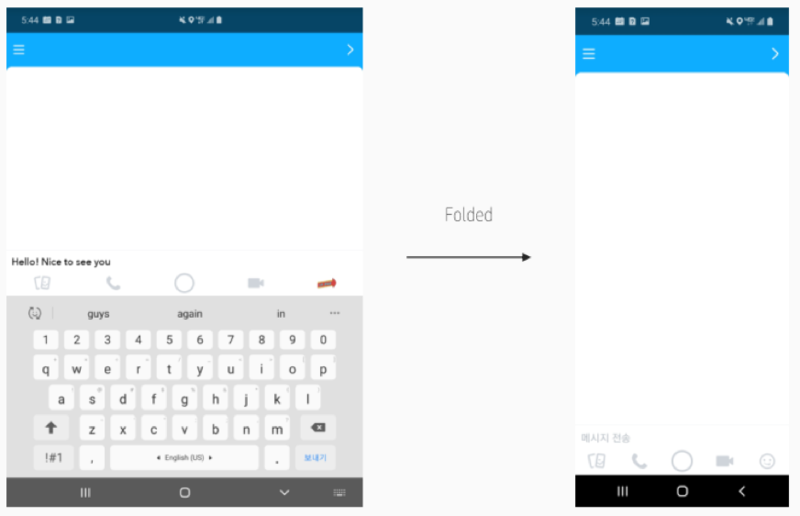 In this blog, I’ll address some of the common mistakes developers may make when developing apps for foldable devices. The Main Display is covered by an area on the top-right side called the “L-cut.” If no action is taken, it’s possible that some UI portion of your app could be covered by the L-cut. layoutInDisplayCutoutMode attribute to the activity. Default: In portrait mode, content is rendered in cutout area but in landscape mode content is letterboxed. ShortEdge: Content is rendered in the cutout area in both portrait and landscape mode. Never: No content is rendered in the cutout area. The Cover Display of the Galaxy Fold has a long (21:9) aspect ratio. Some apps cannot fill the Cover Display and its 21:9 aspect ratio screen. If your app is announced as android.max_aspect="2.1", it will support up to 18.5:9. 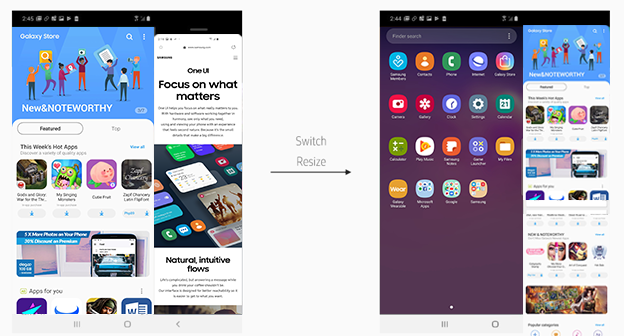 Developers have to consider two different displays when developing an app targeted for foldable phones. Your app layout should respond to different screen sizes. Create a flexible layout. UI layouts should be always responsive even if the target device variation is small. In the case of foldable devices, the difference in the displays is significant. According to Android documentation, one of the best ways to create a responsive layout for different screen sizes is to create a ConstraintLayout. Using the values "wrap_content" and "match_parent" instead of a fixed layout size creates a flexible layout that adapts to different screen sizes. Use alternative UI layouts based on different screen configuration. Stretching does not always provide the best experience. Sometimes, alternative UI design is needed for different screen sizes. An alternative UI design may need alternative layout resources. Use bitmaps that can stretch to adapt to the screen. 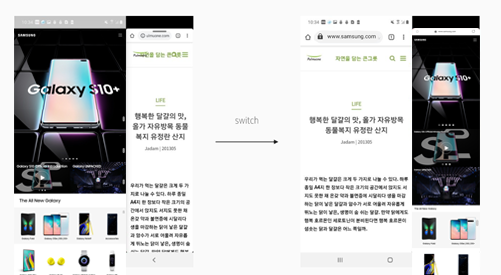 When a bitmap is used as a background in a view that changes its size, Android will scale the bitmap images based on the size of the screen or content in view. This leads to visible blurring or other scaling artifacts. This problem can be overcome by using nine-patch bitmaps. A nine-patch bitmap is similar to a standard PNG file but has an extra 1px border to indicate which pixels should be stretched. The extension of nine-patch bitmap is with a .9.png instead of .png. The activity is destroyed and recreated when switching from Main Display to Cover Display or vice-versa. 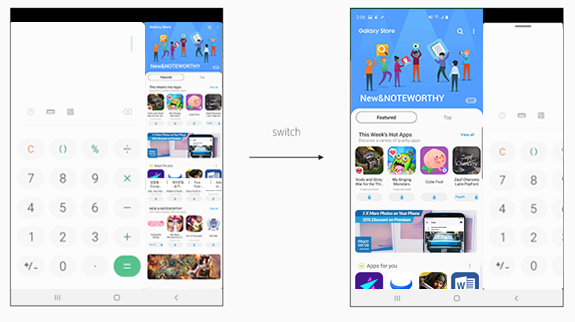 To provide a seamless experience to users, developers have to restore the view layout when switching displays. Developers can use onSaveInstanceState() to save data at the time of destroying the activity, and restore during re-launch of the activity. Developers can also use ViewModel to restore the view layout. Data can be lost when switching to multi-window mode or resizing the window on multi-window mode, as the activity will be re-launched like when switching displays. The solution to this issue is to use onSaveInstanceState() or ViewModel. Layout issues can occur at the time of multi-window launching/ switching /resizing. They occur when the provided resource does not fit the current window size. If you set larger minWidth, minHeight than the possible window size, the result may be layout fitting issues. So, provide resources and set minWidth, minHeight, keeping in mind the possible window sizes in multi-window mode. The application may crash when the displays are resized or switched in multi-window mode. onDestroy(). This can cause the app to close. 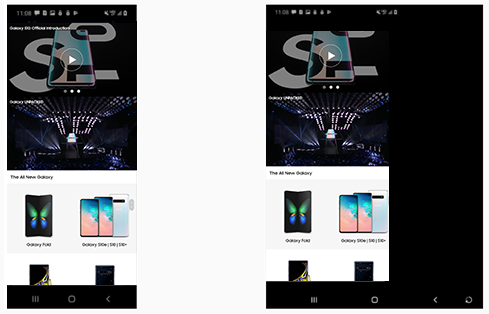 Avoiding the above mistakes will ensure your app performs seamlessly on the Samsung Galaxy Foldable. This is an exciting time for smartphones, and we look forward to the amazing ways in which developers will embrace foldable technology. Its really very helpful information. Thank you, Md. Iqbal Hossain. This was a really good informational article.